LONG BEACH— For the Atlanta Braves first base has been a dead zone for quite some time. A home grown talent at this position has been lacking. The best talent to man the position has been brought in through free agency or trade, mainly trade. Dating this position back to 1991 we find Sid Bream, a veteran presence brought in to solidify a young group of players bound to begin an historical run of first place finishes. Fred McGriff was to follow. The Big Cat there after. And finally Mark Teixeira. To be certain, there were some fill-ins along the way. The most notable of which was Adam LaRoche, the loan home grown talent to smack 30 home runs in a single season. But LaRoche had a weakness. A weakness not unlike Kelly Johnson. While LaRoche would put up solid numbers by years end, he’d do so by contributing two stellar months and four crippling months burdened down by excessive strikeouts. He was a streaky hitter. This off season however the Braves already have a first baseman. He isn’t the mega-star slugger that Fred McGriff, Big Cat or Mark Teixeira were. To his benefit his numbers suggest he’ll be a solid 25 home run guy with a good average and very few strikeouts. Consistency. He didn’t appear to portray this skill when he first came to Atlanta. But this might have had something to do with going from first place to second to last while learning that his mother was also going from top health to near death. This could distract the strongest of men, and Kotchman is a man. But will Kotchman be “Clutch-Man” or will he be “Crutch-Man”? It is a similar question the Braves faced with LaRoche. Will he be La-Stroke or La-Choke? In the minor leagues Casey had more walks than strikeouts to go along with a .325 average. His on base percentage was solid but mainly attributed to his large total of hits he’d pile up. This isn’t necessarily bad, but it does imply that things must go his way quite often. On the other hand it would imply that he is a good man to have in the line up to knock in runs as he hits the ball all over the place. A walk is efficient for setting up the run, but the hit is the best tool for driving them in. A walk can only drive in a run when the bases are loaded, and unfortunately that isn’t all the time. In 2007 Kotchman had his “break-out” year in the majors. It was the most time in the majors he’d had in a single season having been up three times prior for various stints. In 2007 Kotchman hit .297 with 37 doubles, 11 home runs and a .374 on base percentage. These would be great numbers for the Braves assuming they can find a man in Left to provide the pop. His 2008 was sort of a step back, but could be glossed over with the view point of the “sophomore slump”. Brian McCann had a slump of sorts in his second full season only to come back as a force in his third full season. If Kotchman can return to his 2007 numbers and play in about 150+ games, the team will be fine at first. I don’t see them trading him for anything as there is no viable replacement ready for the majors in the Braves system. However, there is a young man by the name of Freddie Freeman in the minors. He and the great Jason Heyward teamed up to do some serious damage in the minors. Freeman is still a few years from the majors, but his progress might coincide perfectly with Kotchman’s “player’s right” of free agency and arbitration years. If Freeman continues to progress and Kotchman too continues to progress the Braves will be in a solid position in 2010 or 2011 for trading and shoring up the team. Kotchman was solid, but not overwhelming. He was sort of the “forgotten” acquisition this year, I though. At games, I think Braves fans were always surprised when his name was posted on the board- they always had a “who is this guy?” look on their face when he came up to bat. He didn’t help himself by being mediocre in his short time w/ the Braves. He’s solid, I agree. But he’s a guy I look at and think, this is why the Braves are going to remain a .500 team for a while. We’re stuck hoping that he and others like him pull out miracle season when their backgrounds tell us they are not really all that great. We are dependent on too many guys like this, I fear. I don’t think so. 1991 we had a lot of average guys and great pitching. If we can restore the pitching, and Kotchman does his average business, the team will be fine. Winning it all is a pretty tall order though. That will take several years. 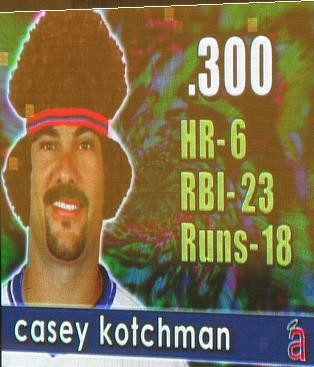 Kotchman has the ability to hit for average and hit a lot of doubles. It isn’t home run power, but while with the Angels he was able to assist in a winning team with no strong power outlet. Left Field is what needs the upgrade… can’t wait until a certain author publishes that missive…. And I dare him to find a better photo of a player. Enter your email address to subscribe to American Missive and receive notifications of new missives by email. Dead Goats and Week 2 K.E.P. An Oasis In the Desert or Only a Mirage?